NASA has just announced plans for their next launch that will propel a robotic vehicle to the red planet. The US space authority is working with United Launch Alliance to put its new InSight craft on a northern region of Mars. The team of experts driving this mission have worked out a window, in May, that will last for a short time. The launch will be conducted in a manner that will help InSight into its ideal orbit and subsequent trajectory, toward its destination. This endeavor, if successful, will deploy technology designed to help NASA gain a deeper insight into the planet prior to any manned missions. The expedition stands out as the first one to use a launch-pad located on the west coast of America. InSight will take off from a site at Vandenberg Air Force Base in California, and will do so aboard United Launch Alliance's Altas V rocket. NASA has reported that Atlas V will provide nearly 4 million newtons of force to propel it and its payload, away from Vandenburg, into the air. The rocket will then be programmed to describe an arc that will bring it close to the South Pole, gaining 9 kilometers in altitude (and also Mach 1). The stage is believed to be set to last for two minutes and thirty-six seconds, at which point it will have an altitude of 66 kilometers. This will pave the way for the first stage of Atlas V to shut down, and for the second stage, Centaur, to take over. Centaur's engines, which offer just under 102,000 newtons of thrust, will kick in ten seconds after decoupling from the first-stage rocket. These engines will deliver it (with the InSight payload still intact) into an orbit that acts as a holding pattern. The system will be in-effect until Centaur's last burn puts InSight into its previously-calculated Mars-bound trajectory. NASA estimates that this process will take 79 minutes after the launch's initiation. InSight will separate from Centaur 14 minutes after and continue on to its destination, which it will reach approximately six months later. The actual launch is scheduled for a window that will last from the 5th of May until the 6th of June 2018. Presuming that it is successful, InSight will be on a mission to evaluate the geology, seismology and thermal patterns of the red planet. To this end, the craft is destined to land on Elysium Planitia, a northerly Martian region. InSight will be a static module, as opposed to the Rovers that have dominated the past few missions to the same planet. The scientists who will study the information gathered by Insight hope that it will help define the history of Mars from the start, including the nature of its formation. The scientists for this project will hail from countries other than the United States. Several European groups have already constructed instruments and probes for InSight. For example, the Deutsches Zentrum für Luft- und Raumfahrt (German Aerospace Center) have contributed a thermal probe. This instrument is capable of burying itself to a depth of up to 5 meters. If it can achieve this on Mars, a lot of valuable information can be gained about the temperature of the planet's core. In addition, a transnational team working at the French National Space Studies Center has developed a seismic probe for use by InSight. These tools will help in deployment by the robotic craft from its position in Elysium Planitia. InSight's mission can be termed exceptional for many reasons. It could be the only launch to date from the Pacific Coast - people living as far north as Bakersfield in California to Rosarito in Baja California, in the south, will be able to watch the spectacle. However, if the mission begins on the first day of the window, it will start at about 4 am. However, if the mission begins on the first day of the window, they will have to be up from about 4 am their time to do so. The French probe will also be the first seismometer deployed on a surface besides that of the Earth, since the Apollo missions. The instrument will be used to confirm data that has led to suspicions that Mars evinces activity equivalent to that associated with snowstorms and earthquakes on this planet. Natural hazards like quakes could pose a danger to putative Martian colonists. But from the perspective of the InSight mission, it may prove a useful 'gateway' through which geological information on the planet's interior can be accessed. The NASA scientists believe that seismological vibrations gathered during a 'Mars-quake' could be used to infer the nature of planetary matter they travel through. This could be the reason why InSight's seismological array will be packaged in a regular, low cylinder, topped with a dome that will sit on the planet's surface to gather data. 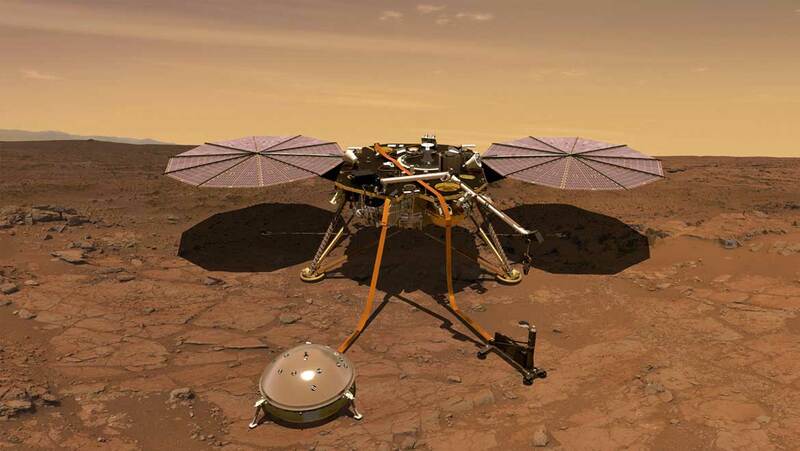 The InSight mission to Mars will involve an unmanned craft. It will possess the ability to deploy a number of instruments. These tools can then collect valuable data about the nature of the planet and its origins. The craft will be launched using the Atlas V rocket from an Air Force base in California, in order to exploit an orbit and trajectory that should be received by the red planet around the 26th of November 2018. These events can be seen from various locations in the US and Mexico, and also on https://www.nasa.gov/live. InSight is intended to confirm, among other things, the presence of significant seismic activity on the nearby planet, Mars.